All of Black Oak’s lights including their six-inch light bar feature rugged build quality, IP69K intrusion protection and 50,000 hour lifespans made possible by high-efficiency LEDs and reliable LED driver circuitry. Double-sized heat sinks keep the LEDs running cool and bright. Every Black Oak light bar comes with a turnkey waterproof wiring harness, including the relay, switch and fuse, so there is nothing else to buy. 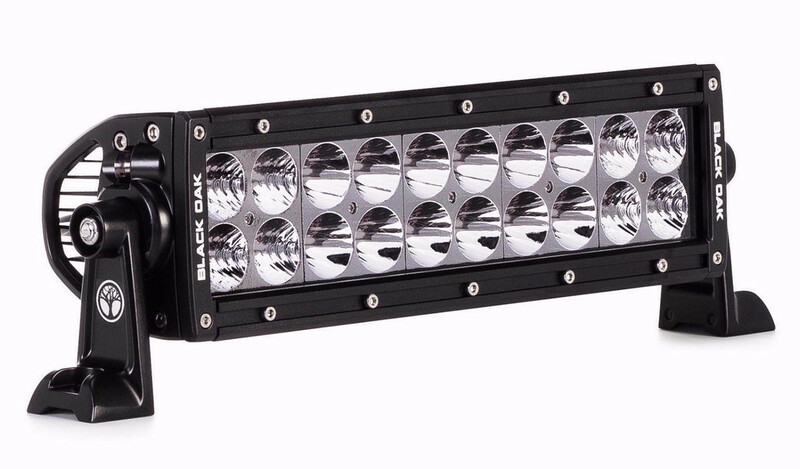 If you are an avid lover of extreme sports, then this light bar would fit perfectly on your ATV or UTV. 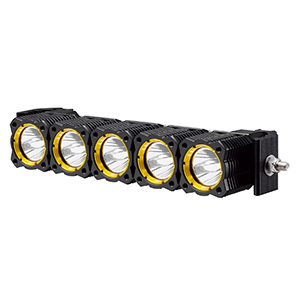 The D-Series 6-incher is a popular choice in the flagship line-up of Black Oak D-Series double-row LED light bars. Buyers find applications for one or a pair of these super-bright light bars on all types of vehicles on and off the highway. Even with the 3W Osram LEDs, the spot version of this light bar is nearly impossible to outrun on the highway or trail. The flood or combo configurations light up a wide swath of road or any work site as if it were daytime. Black Oak’s combination of industry-leading build quality and pricing is shaking up the LED light bar world. Their D-Series 6-inch light bar is the perfect example of how they are rattling their competitors with top performance at about half the price. Either the super-bright 3W version or the crazy-bright 5W version of this light bar represent the absolute best value on the market. Black Oak’s double-row 10-inch light bar features 50,000 hour 3W or 5W top-bin Osram LEDs with superb watt-per-lumen efficiency. This light bar runs cool and bright thanks to tight-spec LED driver circuitry and double-sized heat sinks integral to the robust, waterproof aluminum housing. The 10-inchers mount easily in a grill, below the bumper or on an overhead mount bar. Backed by a lifetime warranty against defects, this light stands up to the rigors of the trail and over 30 environmental hazards. You will be thoroughly impressed with the 3W LED version of this light. If your nights are darker than pitch, try the 5W version. It will illuminate every nook and cranny. 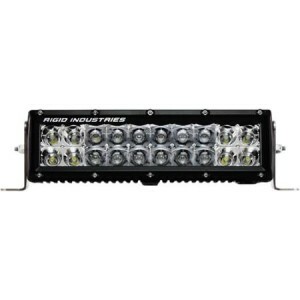 The build on these lights exceeds that from bigger, well-known light bar manufacturers with heavy, thick housings, plenty of stainless steel hardware and an unbreakable polycarbonate lens. Ninety-nine percent of their U.S.-made Osram LEDs luminance is projected forward via computer-designed reflectors. Choose from a distance-penetrating spot, a permeating flood or a combo beam to suit your application. 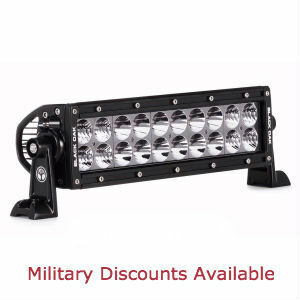 Buyer often buy these 10-inch light bars for use as work lights, driving lights or navigation lights on boats. Public service vehicles find them indispensable for scene illumination. The Black Oak’s 10-inch dual-row light bar is an over-achiever that never disappoints. Its top-notch brightness and hefty build ensure you get all the gloom-illuminating value possible for as long as you own them. This light bar’s performance is the best money can buy at an affordable price. 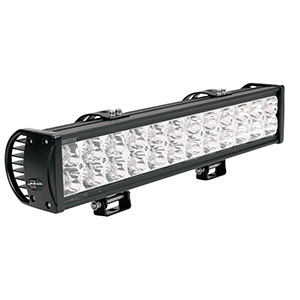 When you need acres of light, Black Oak’s double-row 40-inch light bar delivers the goods. Its twin rows of Osram 5W LEDs blast out over 47,000 lumens that splinter the darkest nights with daylight brightness. Mounted on top of your 4×4 truck or jeep, you will never outrun the terrain ahead even on fast trails. Each light bar is built to withstand over 30 environmental hazards and mechanical stresses. 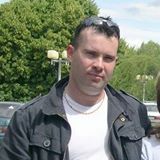 It is backed by a no-questions-asked 30-day cash back guarantee and a lifetime warranty against defects. Expect this light to outlast the vehicle upon which it is mounted with 50,000 lifespan LEDs, an IP69K rating against dust and moisture, rugged aluminum housing and stainless steel hardware. It all comes with a complete, turnkey, IP69K wiring harness, so you can unpack it, mount it and start using it in as short a time as possible. 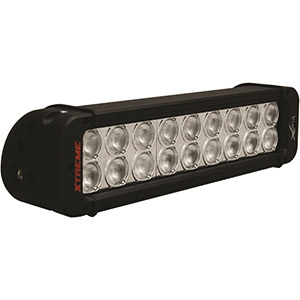 The Black Oak 40-inch dual-row light bar turns night into day on remote trails, out on the farm, in quarries or in response to an accident with the highest levels of brightness and penetration possible. Even buyers who have purchased 50-inch LED light bars from other top manufacturers find this one brighter and without any voids in the beam. You need binoculars to see to the furthest edge of the spot beam and the flood beam puts an entire worksite awash in light. Most buyers get the combo beam to light the sides of the road while providing plenty of forward reach. 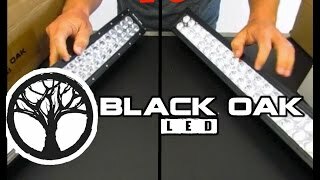 Black Oak’s 40-inch dual-row light bar is beyond bright regardless of which beam pattern you choose. It is completely waterproof and dust proof and the oversize heat sinks and rugged circuitry guaranteed many years of use without fail. Everything screams quality about this light except the price.